LAWRENCE — Soaring some 23 miles over the South Pole, a University of Kansas experiment slung from a high-altitude weather balloon is calculating how the surface of Antarctica reflects radio signals caused by ultra-high-energy cosmic rays. The Hi-Cal (High-Altitude Calibration) experiment loops around the South Pole, trailing hundreds of miles behind yet another cluster of instruments strapped to a much larger balloon, called ANITA (for Antarctic Impulsive Transient Antenna, and funded by NASA since 2003).The ultimate experimental goal is to measure ultra-high energy neutrinos and ultra-high energy cosmic rays that interact in the Antarctic ice, or with the Earth’s atmosphere, creating radio waves. To understand the purpose of Hi-Cal, first grasping the research mission of ANITA is key. “The ANITA experiment is to detect ultra-high energy cosmic rays, and these are detected by virtue of the radio frequency radiation produced when a cosmic ray hits a terrestrial molecule — that creates spray of debris including particles and radio frequency radiation,” said David Besson, professor of physics & astronomy at KU, who is leading the Hi-Cal team. Besson said the down-coming cosmic rays generate radio frequencies detected by ANITA primarily as surface reflections, bouncing back up from the surface of Antarctica. “To understand the properties from the radio frequencies ANITA collects, you have to understand the surface reflectivity,” Besson said. Here is where the Hi-Cal experiment operated by KU comes in to play. While the lead ANITA balloon is laden with thousands of dollars of high-tech gadgetry, the follow-on Hi-Cal balloon uses a piezoelectric lighter anyone could buy at a hardware store as its pinging device. Unlike lighters with a flint mechanism, piezoelectric lighters work when compressed mechanically and suddenly released. 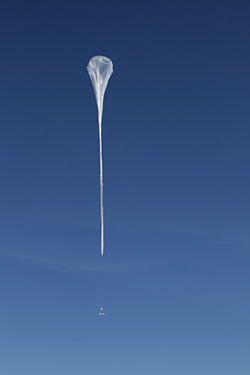 Funded by $230,000 of NASA funding about three years ago, the Hi-Cal balloon with its barbeque-lighter ping have flown three experimental missions in a quest to better grasp Antarctica’s reflectivity to radio frequencies. Key researchers at KU working on the experiment include Steven Prohira, Sasha Novikov, Jessica Stockham and Mark Stockham. 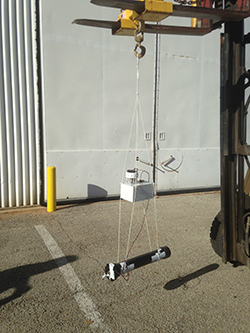 The smaller Hi-Cal payload is not recovered. Besson said the last flight of Hi-Cal lasted for about 10 days. Both experiments will fly in tandem again in 2020. According to the KU researcher, as the scientists behind both Hi-Cal and ANITA amass more data, they hope to be able to detect the source the ultra-high-energy cosmic rays. Besson suggested that recently ANITA may have landed upon an even deeper mystery. Top photo: Launching the Hi-Cal experiment. Top right: The Hi-Cal soars above Antarctica to circle the South Pole trailing ANITA. Bottom right: The Hi-Cal payload has at its heart a piezoelectric lighter. Images courtesy of Steven Prohira and Alexander Novikov.